Kama Sutra Aromatics Sensual Massage Oil is made with essential oils to promote deep relaxation. This rich, emollient formula makes it a pleasure to give or receive a sensuous, full-body massage. 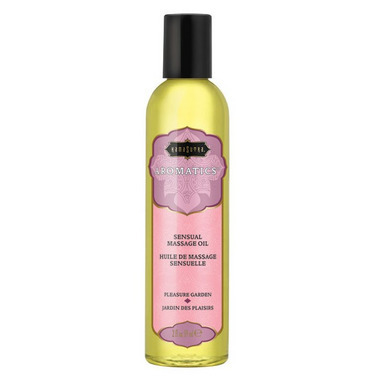 Pour Kama Sutra's massage oils into the bath or smooth onto the body as a daily moisturizer for silky, hydrated skin. This massage oil uses a refreshing blend of orange, lemon, mint, geranium, ginger, fennel and rose to invigorate the spirit. As a daily moisturizer: Smooth the oil onto the body after a bath or shower to lock in moisture and leave skin super-soft and smelling sweet all day long. For sensual massage: Pour oil into your hands or directly onto your partner’s body and massage the oil into their skin with slow, even strokes. For the bath: Pour into running bath water. Emerge with soft, silky skin! Ingredients: Glycine Soja (Soybean) Oil, Vitis Vinifera (Grape) Seed Oil, Pistacia Vera Seed Oil, C 12-15 Alkyl Benzoate, Caprylic/capric Triglyceride, Prunus Amygdalus Dulcis (Sweet Almond) Oil, Fragrance (Parfum), Tocopheryl Acetate, Lecithin, Amyl Cinnamal, Benzyl Benzoate, Citronellol, Geraniol, Limonene, Linalool. I wish everything smelled this good.